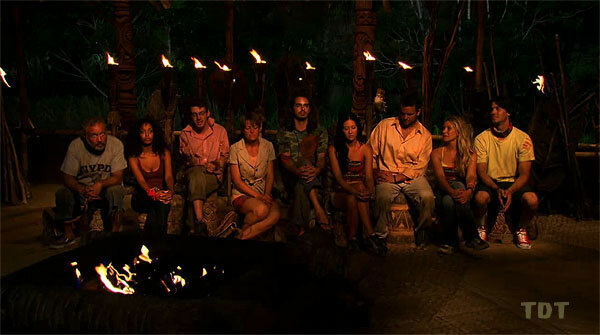 Survivor: South Pacific (2011) - 17th place, 2nd out. Voted out in Episode 3, "Reap What You Sow" (Day 8). Eliminated in a duel (by Christine Shields-Markoski) in Episode 4, "Survivalism" (Day 9). Cumulative totals: In-game - 8 days; Redemption Island - 1 day. South Pacific Ep. 2 RC/IC: "Crate Escape" - With Ozzy, Jim, & Keith, works the slide puzzle, and Savaii wins. South Pacific Ep. 3 RC/IC: "Hitching A Ride" - Cranks the wheel for Savaii, which loses on the puzzle. South Pacific Ep. 4 Duel: "Sandbagging" - Papa Bear barely loses to Christine, 10-9 (2nd/2). South Pacific, Ep. 3: Pretends to find an idol, fools nobody, except maybe Jim. South Pacific, Ep. 1: Semhar Tadesse (voted out, 8-1). South Pacific, Ep. 3: Six votes, from Ozzy, Cochran, Whitney, Dawn, Keith, and Elyse (voted out, 6-1-1). You guys need to pick it up! Or slide it up. Gordon Holmes at XfinityTV (8/22/11): "Survivor: South Pacific Pre-Game Interview: Mark Caruso"
Gordon Holmes at XfinityTV (10/6/11): "Castaway Interview: Mark 'Papa Bear' Caruso"
Rob & Nicole Cesternino at RobHasAPodcast (10/6/11): "The Story of 'Papa Bear' Mark Caruso"
Daniel Fienberg at HitFix.com (10/8/11): "Mark 'Papa Bear' Caruso Talks Survivor: South Pacific"
Patrick Gomez at People.com (10/11/11): "Mark Caruso 'Left a Gentleman'"
"'I call myself Daddy Bear,' says the openly gay former NYPD morgue detective. 'I'm older, wiser, and cuter, I guess. No, I'm kidding. I'm not cuter.' One thing he's not kidding about, however, is which two former players he'd like to see return this season. 'I would like to see Jane. And I know people may not like hearing this, but I like Russell. I do! I just like him! I worked in the New York City police department for 20 years. There's a thousand Russels.'" "Personal claim to fame: I was a NYPD Morgue Detective for 20 years and I retired with honors from the mayor and police commissioner. Inspiration in life: My deceased Aunt Mary, who brought us to her home, raised us and gave us a great life. Pet peeves: Know-it-alls and people with “I am better than you” attitudes. 3 words to describe you: Funny, sarcastic and lovable. Why you think you will be the sole Survivor: People tend to like me because I am an honest person even though I am sarcastic and an “in your face” man. I am considered a real person heart, mind and soul."